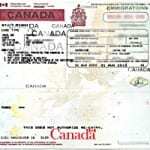 A study permit authorizes you to study in Canada legally. International students will receive their Study Permits in the form of a paper document which will usually be attached into your passport at the Canadian port of entry. Study permits will only be issued to applicants studying at a Designated Learning Institution (DLI). York University is a designated learning institution: York University's Designated Learning Institute (DLI) Number is O19361109242 (O stands for Ontario). Ensure that you have entered your Citizenship and Immigration Canada (CIC) Universal client ID (UCI) number onto your student record (click “Update my international student information” from My Student Records on My Online Services). This will enable York International to assist you as necessary. If you are not a Canadian citizen or permanent resident of Canada and will be attending York University for more than 6 months, you must obtain a study permit from Citizenship and Immigration Canada (CIC). If your program of study lasts six month or less in Canada, you do not need a study permit. However, if you think you may study for a longer time, you should consider applying for one prior to your arrival because the process of initial study permit can be lengthy and complicated. If your study permit application is approved, you will be issued a Letter of Introduction (see example below). 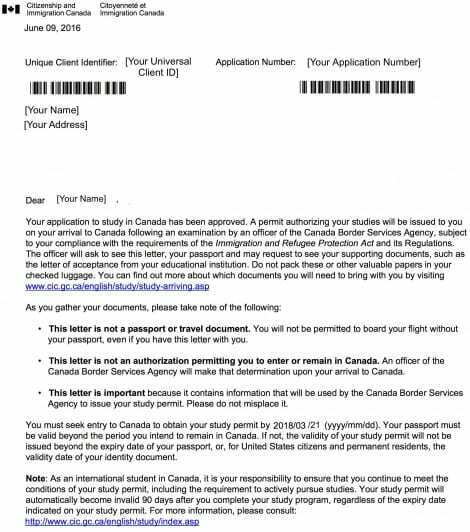 You must present this letter to the border officer when you enter Canada, and your study permit will be printed and issued at the border. A study permit does not authorize re-entry. Depending on your citizenship, you may require a Temporary Resident Visa (TRV) or eTA to enter and re-enter Canada. Please click here to find out whether you need to obtain a TRV or eTA. Most newly-accepted international students can now apply for their study permits online from their home country. You are required to apply for the initial study permit before coming to Canada. Instructions on initial study permit application can be found here. Processing time varies depending on the processing centre location. Please allow a minimum of one to six months. International students should maintain their study permits valid throughout the entire study in Canada. If the length of your study permit is going to expire before you complete your studies, you should extend your study permit at least 30 days prior to the expiry. Study permit can be extended online or by paper application. Please click here for more information. Complete the questionnaire based on your current situation, and choose the "Study Permit" option after. Fill out the Application Form IMM5709, scan and upload all other required documents. Pay the application fee CAD$150 as instructed here. Please note that the application fee can only be paid online with credit card. Complete the required application forms and collect all required documents. Mail the application package to the Case Processing Center in Vegreville, Alberta as specified in the Instruction Guide. Registered mail with tracking number is recommended. Save a hard or soft copy of the application form and all documents for your reference in case CIC is requesting additional documents. Your incomplete online application can be saved on your MyCIC account for 60 days and you must complete and submit within this period. When you are applying to extend your study permit you can also apply for co-op work permit at the same time. IMM5709 has to be validated before being uploaded to your MyCIC. If you already have a valid study permit for post-secondary study in Canada, you may change your institution or program without applying for a new study permit. However, you need to change your Designated Learning Institution (DLI) via your CIC account. Please click here for more information. If you submit a study permit extension application before your current study permit expires, you will have implied status, meaning that you can legally remain in Canada and continue to study until a decision is made by CIC, as long as you remain in Canada. Please click here for more information. If your study permit expires before you apply for an extension, you will be considered "out of status." You must speak with an advisor at York International immediately. When you are out of status, you may not be able to attend school until your application for restoration has been approved. You have 90 days from the day you lost your status to apply for restoration which can be done online or by paper application. Please click here for details of restoration. If your study permit has expired for more than 90 days ago and you have not applied for a restoration, you will NOT be able to renew your study permit. You will have to leave the country and apply for a new study permit outside of Canada. For more information about Study Permits, feel free to check out the Immigration Tutorial Videos page.